This is your opportunity to get out of the home office! 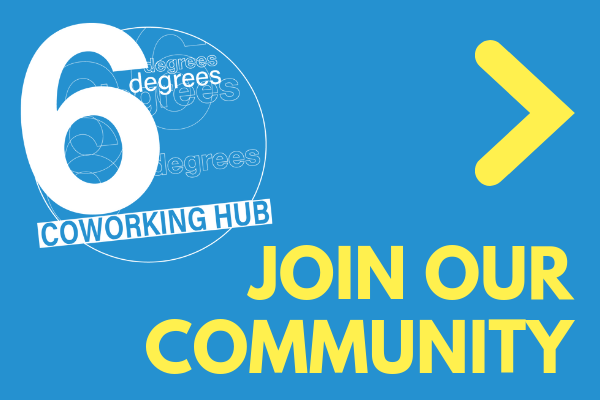 Come along and work with others in a convivial and collaborative atmosphere. 6 degrees has been collaborating with the Coffs Harbour Innovation Centre and we have developed this special offer for you. The numbers are strictly limited so please send your Expression of Interest to Julianne McKeon as soon as possible. Desk and chair. (Casuals will need to book). Julianne has developed a range of low cost options so that businesses at early stages of their life-cycle can jump in and grow. Costs for use of the Co-working space at the Innovation Centre are set to cover your space, electricity and internet useage. Notes: Additional access on weekends could be negotiated at an extra cost. Hot desk users would be asked to pay for Boardroom access (approximately $50 + GST per day or half day) Public Liability Insurance cover would be encouraged. Co-workers will be required to sign up for a minimum of six months. Co-working at the Innovation Centre is still subject to approval of the owners, the Coffs Harbour Technology Park Pty Ltd.
We need your EOI to make it an easy decision for them. Please send the following details to Julianne McKeon if you wish to take advantage of this opportunity. I am interested in co-working at the Coffs Harbour Innovation Centre. I do/do not have Public Liability Insurance.